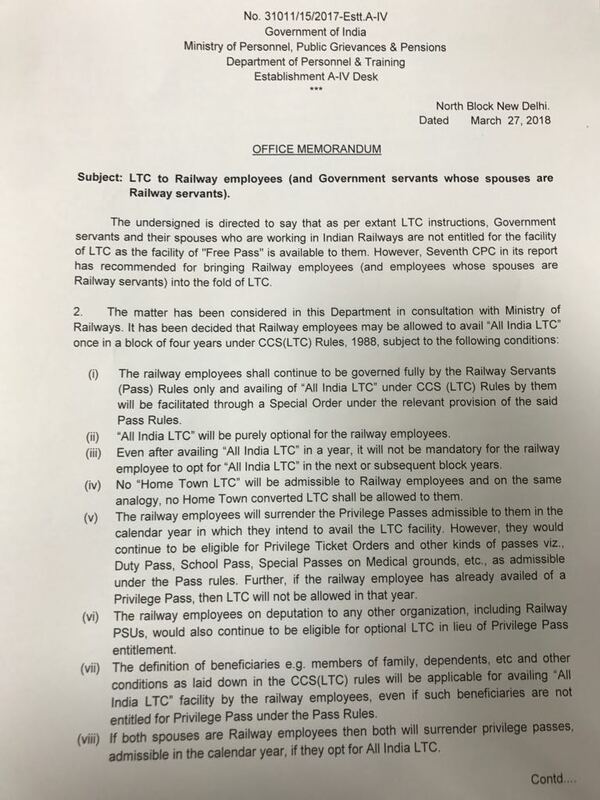 Subject: LTC to Railway employees (and Government servants whose spouses are Railway servants). (i) The railway employees shall continue to be governed fully by the Railway Servants (Pass) Rules only and availing of “All India LTC” under CCS (LTC) Rules by them will be facilitated through a Special Order under the relevant provision of the said Pass Rules. (ii) “All India LTC” will be purely optional for the railway employees. (iv) No “Home Town LTC” will be admissible to Railway employees and on the same analogy, no Home Town converted LTC shall be allowed to them. (v) The railway employees will surrender the Privilege Passes admissible to them In the calendar year in which they intend to avail the LTC facility. However they would continue to be eligible for Privilege Ticket Orders and other kinds of Passes viz., Duty Pass. School Pass, Special Passes on Medical grounds. etc., as admissible under the Pass rules. Further, if the railway employee has already availed of a Privilege Pass, then LTC will not be allowed in that year. (vi) The railway employees on deputation to any other organization, Including Railway PSUs, would also continue to be eligible for optional LTC in lieu of Privilege Pass entitlement. (vii) The definition of beneficiaries e g members of family, dependents etc. and other conditions as laid down in the CCS(L TC) rules will be applicable for availing ‘All India LTC” facility by the railway employees even if such beneficiaries are not entitled for Privilege Pass under the Pass Rules. (viii) If both spouses are Railway employees then both will surrender admissible in the calendar year, if they opt for All India LTC.